The 1st day of Spring is my one of my favourite days. I feel like I can shake off the drudgery of winter. There are wafts of floral perfumes in the air and a warmth. It's also my Nanas birthday! 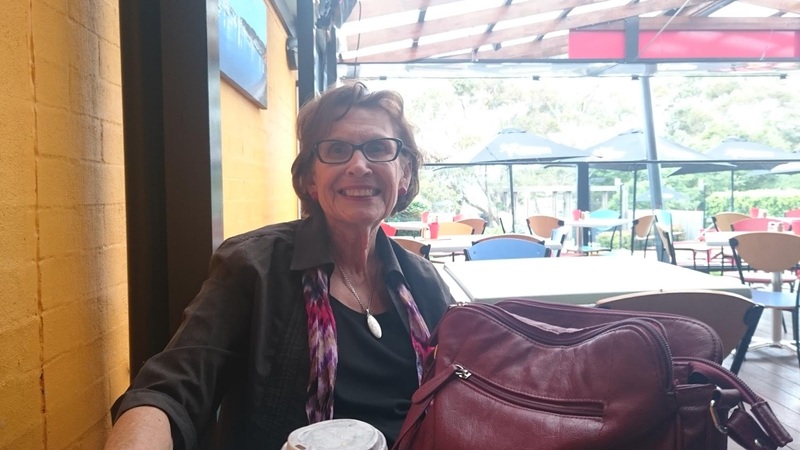 She has one of those lilting voices you hear out of the old movies from the 40s and 50s and is always ready to smile, laugh and hug. My lovely Nana. Isn't she beautiful? I pinched this photo of my Auntie Horse Whisperers Facie page. Hope she doesn't mind! We share a love of birds. So for her birthday I gave a bit of cross stitch crochet another go and made this little purse I have called 'Shirley Bird'! 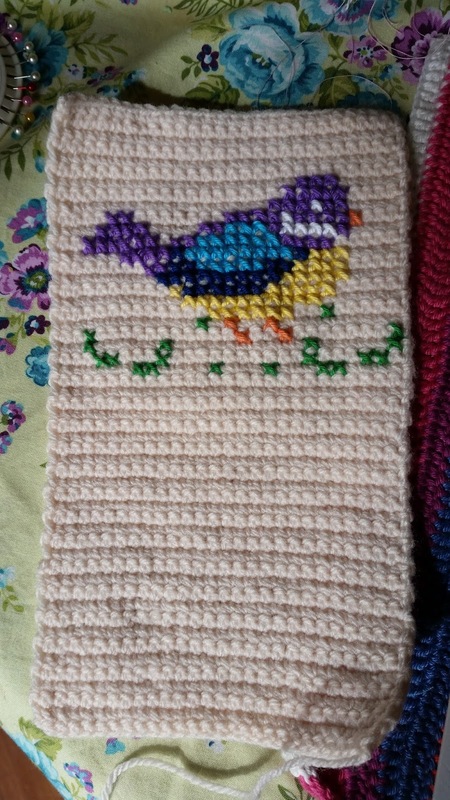 My first effort was this little swatch which I completed a couple of months ago. 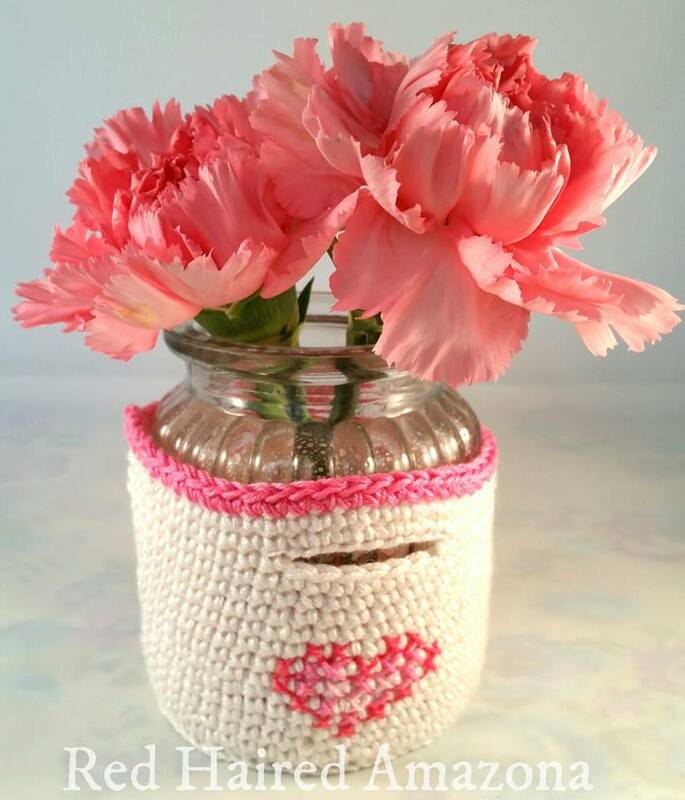 I then made a little jar holder with a simple love heart. It isn't extremely professional I assure you! Me and sewing don't love each other. If you've read some of my other posts, you would have heard all about how we only do it maybe once or twice and year. Like an unhappy 40 year marriage, we tolerate each other for the sake of the kids. 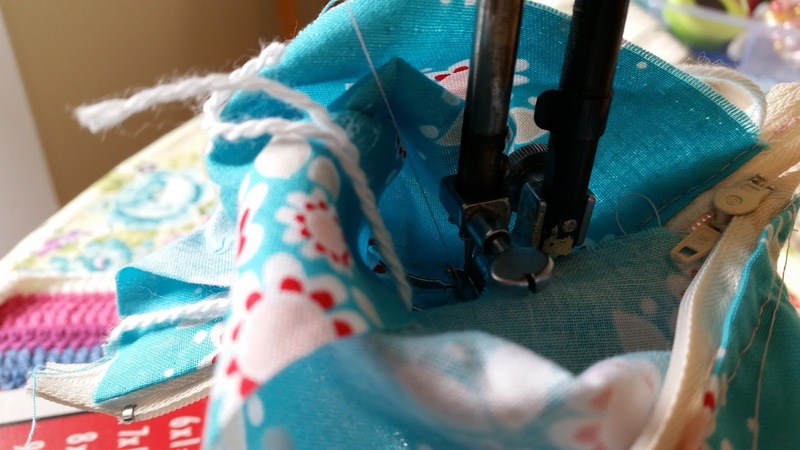 Generally Sewing and I avoid each other but there are rare circumstances where we have no choice but to get on and do the business because our options are limited and necessity prevails. I did have to do the Sewing a little bit in this. I'll try to avoid showing you too much of my manky thready close ups because it's a bit of a dogs breakfast. The crochet bit was the fun part! 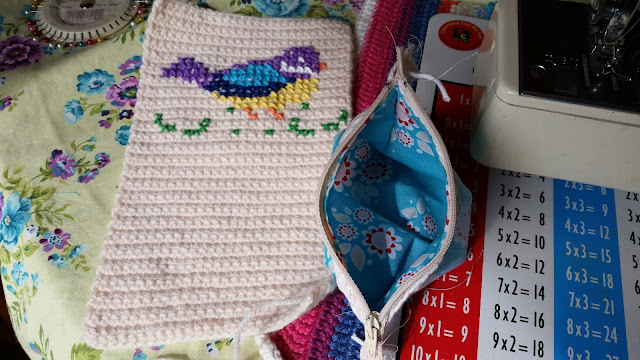 I'm calling this a tutorial instead of a pattern, as it's more of a description of how I did something, rather than a precise set of instructions about how to do something. The body of the purse is super easy. With the 3mm crochet hook and the DK acrylic chain 30. Now in terms of gauge, this needs to be wide enough to accommodate a 5 inch zipper. Row 1: Single crochet into the 2nd chain on the hook and into every ch across. Ch 1, turn. 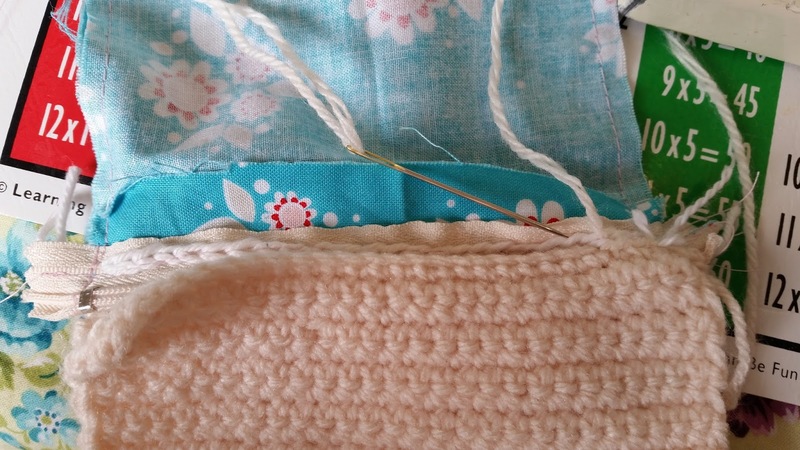 Row 2: SC into the first stitch, then in every sc across. Ch 1, turn. Repeat Row 2 until you have a total of 52 rows or until you achieve the size you require. Then finish off. This rectangle will be folded in half widthways to make the purse body. 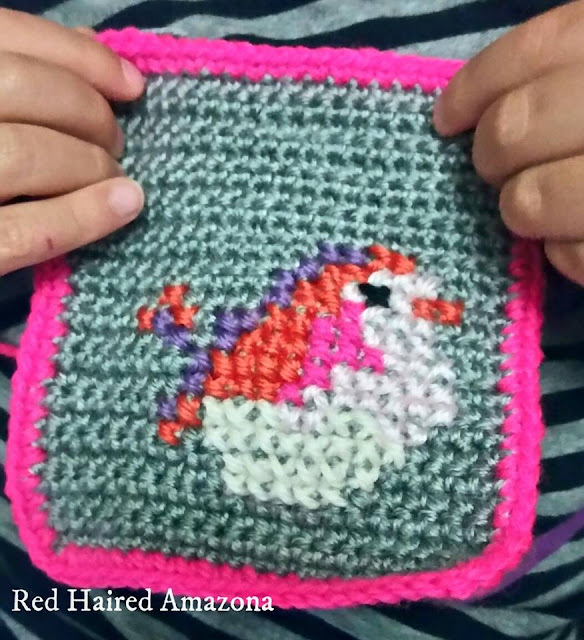 You will cross stitch on the top half of your rectangle as the bottom half will become the back of your purse. Now it's time to cross stitch! 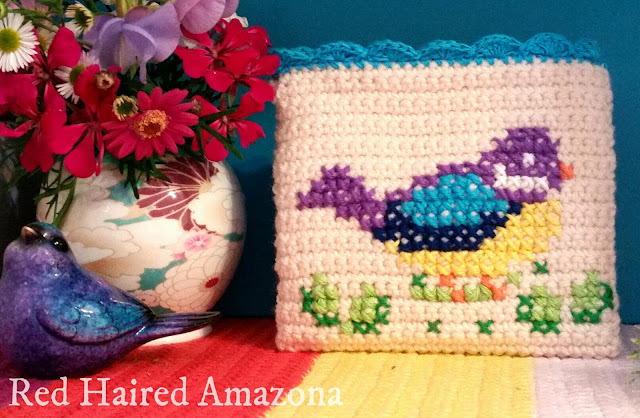 If you've never cross stitched before, it's quite easy but make sure all the little criss cross lines are all pointing the same ways for all your stitches. 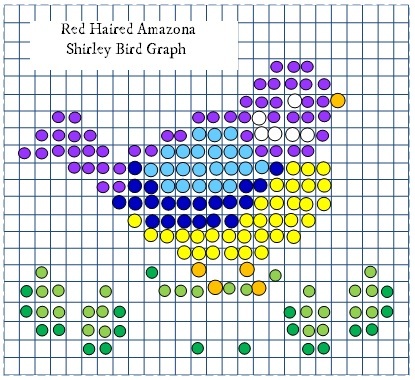 Follow the graph below to create your cross stitch pattern. Or jump on Pinterest and find a cross stitch pattern that you love! Now I just have the light green part of the leaves left to go! Once your cross stitching is finished, it's time to move on to the fabric insert. 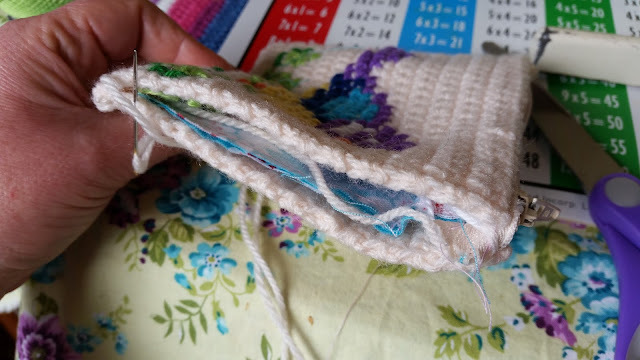 I cut out a pocket from a scrap of spare fabric that was just a few millimetres narrower than the crocheted rectangle. Then I used yarn to sew a chain stitch onto each side of the zipper, so it would be easy to stitch to the crochet rectangle later. It might not be strictly necessary but if you'd like to try it out there's a tutorial on the Frog Knitting website. Now the pouch is complete. The zipper is sewn so it is the 'right way' up, and sewn with each side on the 'wrong side' of the fabric. 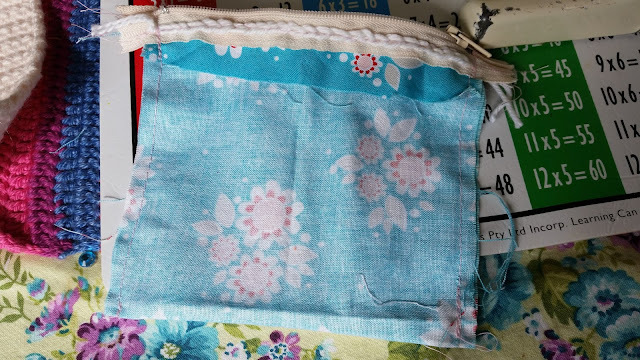 I then sewed up each side of the pouch making it 'pouchy'. And here are the two separate pieces before assembly. 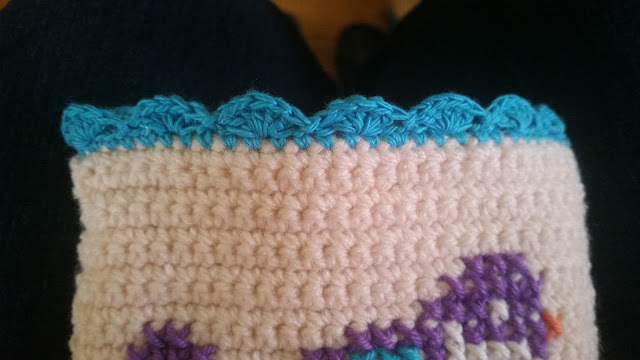 Then I hand sewed the crochet rectangle to the zipper. 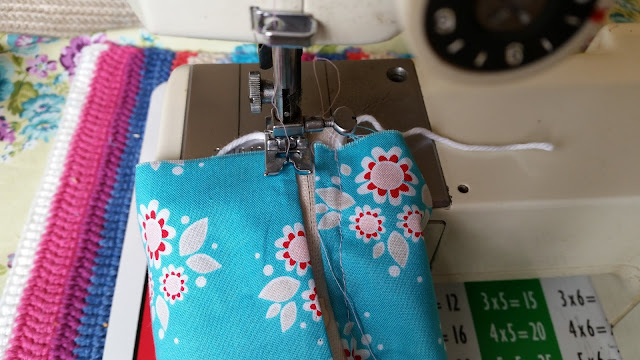 And once that was complete, I was able to hand stitch up both sides of the purse, tucking in all yucky sewing threads AND ensuring the zipper ends were firmly tucked and sewn in. 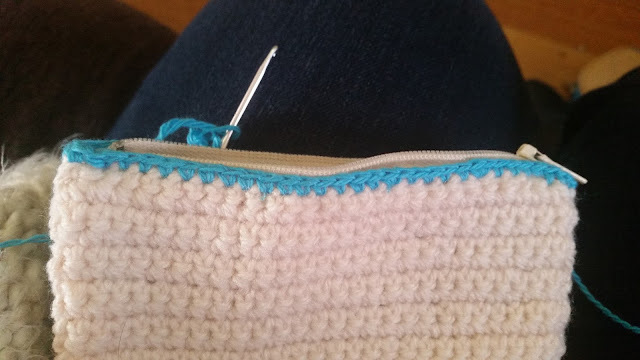 To finish, I grabbed that 3mm crochet hook and did one row of single crochet around the entire top edge. 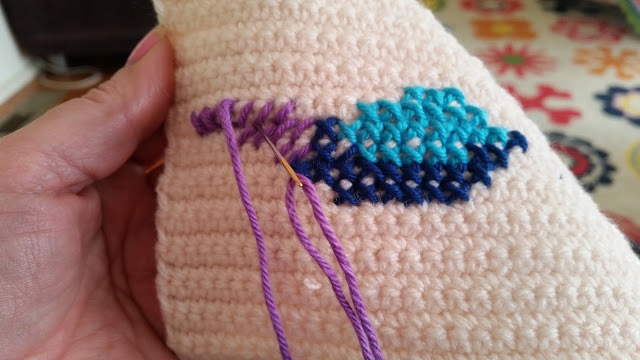 From starting at first stitch, *skip 2 SCs, 5DCs in 3rd SC, sk 2 scs, slip stitch in 3rd sc. Repeat from * all the way around to join with a slip stitch at beginning sc. I sent it in the Post to Nana and she received it the day before her birthday, but waited to open it on the big day and told me she loved it! 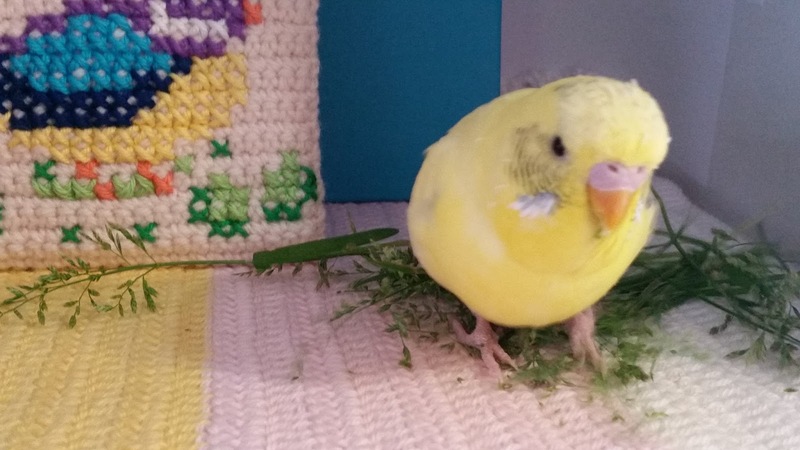 Before I posted it I took a few photos and tried to get Axel the Gender Confused Budgie to pose for a photo. I even tried giving him some grass seed, but sadly (and unsurprisingly) he was non-compliant. He just chomped his way through the seed, mashed and chucked it all over them place, then flew off. Little bugger. If you've got any questions please email me at balibelibear@gmail.com, or pop over to my Facebook page and say hello! If you did enjoy my tutorial or any others you've found on my little blog. Many of my tutorials are free for everyone, however if you'd like to make a little donation, it would be gratefully received and contribute towards future free tutorials! I love it...... what a lovely gift! AWESOME! - IT really turned out well. I'm sure your Nan will adore it! - BTW, Happy B-Day to Her! My Mom has been sewing and tailoring for 70 years... She still hates doing ZIPPERS! - So kudos to you for having a go at it! - Me, I haven't touched a machine in *decades*! I just like to *buy* FABRIC! :-D These days, I leave the *machine* sewing [and sowing] to my Sister. So, hope the BIRD didn't leave any further "gifts" on your nice mat..? I zipped, I lined, I swore, I nearly committed murder of the sewing machine but I got there in the end! What a sweet little project!! 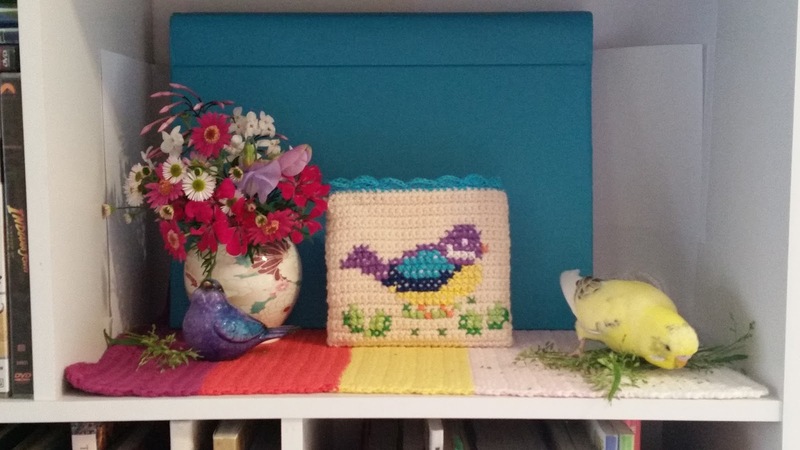 My sister loves cross-stitch, and I love crochet. Thank you! I am really enjoying cross stitch on crochet. I hope to make another project in the next few months! Buy Me a Ball of Yarn/ Coffee. Am addicted to both! Come & check out what I'm Pinning! Red Haired Amazona on Etsy!